We finally hit pay-dirt in Grand Rapids, childhood home of former president Jerry Ford. The same one who served on the Warren Commission that whitewashed the assassination of John F. Kennedy and later pardoned criminal conspirator Richard Nixon. So we were more than a little suspicious, especially after seeing that Rich DeVos and Jay VanAndel - the two men at the top of the Amway pyramid scheme and notorious GOP contributors - had seemingly paid for half the buildings downtown. Anyway, we made our find at a downtown high school with the suspiciously nondescript name "City". It's an alternative high school and middle school operated by the Grand Rapids Public Schools, for "academically gifted and highly motivated students". We wondered: was "gifted" a euphemism for paranormal powers, or did it have an even more sinister meaning? Official sources had originally told us that Gillian had lived in Grand Rapids, and this was commonly reported, so it didn't prove that our informant had any real first-hand knowledge, but it lent some credibility to his claims. City Middle/High is a small school, and in the early 80's it was even smaller, with an enrollment of less than 300 students in grades 7-12. With so few copies of the yearbooks in existence, we eventually gave up locating a private copy and checked the school library. The building in which the school originally was housed was demolished in the late 1990's, perhaps to cover up any evidence that could confirm - or perhaps refute! - Deep Thought's claims. The school was relocated a few miles away; we found it by consulting a current phone book. We only located two volumes with matching photos - which we hastily photographed - before we were discovered by the custodian and asked to leave. These yearbooks didn't contain traditional "mug shots" that we could trace to a professional studio, but instead featured candid snapshots, apparently taken by students. They weren't even in alphabetical order! But the 1981 and 1982 editions of "City's People" each contained photos labeled "Gillian Anderson", and they sort of looked like her. 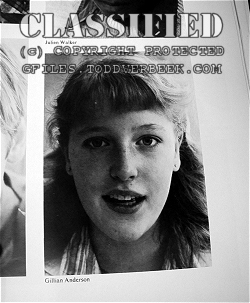 Expert evaluations confirmed that these were either photographs of Gillian Anderson taken in her early teens, or recent photos of a clone of Anderson that had been "hatched" some thirteen years or so earlier. Although it's possible that a campaign of disinformation had already been started that long ago, when "The X-Files" was still in its conceptual development stage and before casting had supposedly begun, we had to consider the possibility that Deep Thought was feeding us the Truth.